Korean traditional costume, hanbok, is a powerful trend not only in its homeland but also on the global stage. K-pop stars such as BTS and the K-drama “Mr. Sunshine” have played a part in spreading the beautiful garments around the world. Here in Seoul, a “hanbok tour” still tops the to-do lists of many domestic and foreign tourists. Hanbok tours of the capital became a sensation in 2013, when the city government began offering free admission to its ancient palaces, such as popular landmarks Gyeongbok Palace and Changdeok Palace, for people in hanbok. The policy was a great success, and the number of inbound tourists wearing hanbok has skyrocketed since then. Yet in line with hanbok’s growing popularity, voices of concern have grown louder questioning the authenticity of the hanbok on Seoul’s streets. They complain of loud, flashy designs not in keeping with Korean fashion in the early 20th century. Or the presence of ribbons, sheer fabric and garments of the wrong proportions or sizes. Most tourists rent their hanbok from local shops, basing their choices on a garment’s visual appeal. For some, it seems, “the fancier, the better.” They may not give much thought to whether the design is true to the original hanbok concept. To add to the irony, most rental shops import Korean hanbok that have been manufactured in China. So what is it that makes a hanbok “traditional”? What standards should an ensemble have to meet to be considered a true hanbok? Apparently, not even hanbok experts have an answer. Park Sun-young, hanbok promotion director of the Hanbok Advancement Center, says it is difficult to draw a clear line differentiating a traditional hanbok from a modernized one. 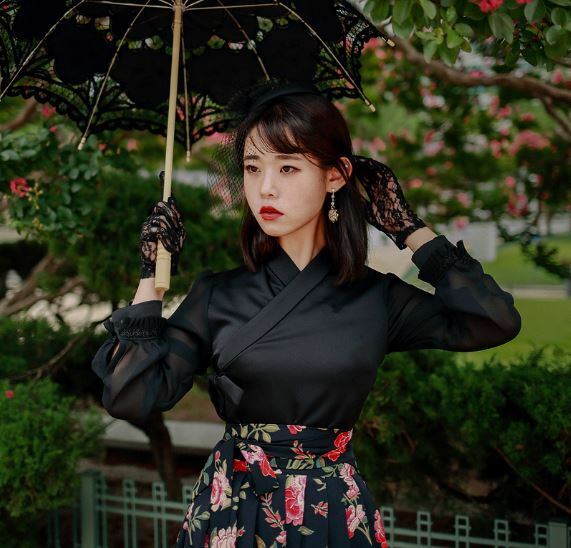 She suggests that the best approach is to include “nonstandard” hanbok within the broader category of hanbok, as wearing either one is a way of showing appreciation for Korean culture. Kwon Miru of Hanbok Traveler also stresses the positive aspects of the hanbok sensation. Hanbok Traveler is a group of young people who wear hanbok in their everyday lives -- wherever they go -- as a way to enjoy and promote the traditional garments. Kwon, one of its founding members, began wearing hanbok in her everyday life in 2013, when doing so was considered “weird” among the general public. Lee Ji-eon, the CEO of modern hanbok brand Happly, strives for a balance between style and tradition. Lee also started off as a mere admirer of the classic garment. When she managed a small hanbok boutique as a college student, she became intrigued with the period of Korean history when Western culture first began to have an influence -- that is, the early 20th century. She created Happly to harmonize Korean and Western fashion.